Classic erysipelas lesions present on a mini pig. Diagnosis confirmed as acute erysipelas..
You know your pig better than anyone else, if your pig isn't acting right, you will be the first person that notices. You will notice a change in behavior, maybe your pig usually runs to the door when you walk outside and didn't do it today, you need to check on your pig then. Pigs are routined animals, they know when it's time to get up, they definitely know when it's time to eat and they know when it's bedtime or mama/piggy time, etc. If your pig is acting different, check them over, take a temperature, look in their eyes, ears and mouths, check feet, check hooves and body/skin....once you start making this daily check part of your routine, you will find that you are able to identify issues super early. Being able to note a change can save your pigs life. Erysipelas is a bacterial infection, caused by a bacteria Erysipelothrix rhusiopathiae. (You will usually not hear it referred to as the scientific name though) The bacteria is usually carried to the soil by bird droppings and other wildlife discussed in more detail in the next paragraph. People can get erysipelas, (although the human form of what is referred to as erysipelas is actually caused by a streptococcus bacteria, not the same type as pigs get) as well as other animals. There are 23 different strands of this disease and no one vaccination will prevent all 23. (Pigs are susceptible to 15 strains) Vaccinating lessens the chances of your pig contracting the top 3 strains of this illness, but doesn't eliminate it completely. Erysipelas vaccinations are done on a semiannual basis (every 6 months) according to the vaccine manufacturers website and erysipelas is a common disease in untreated mini pigs (found that fact on a USDA publication). Once exposed to the bacteria, symptoms are often found within 48 hours, this includes high fever (105-107), depression, vomiting (not common), lameness, lethargy, discoloration of non pigmented skin, diamond shaped wheals or discoloration of the skin (may or nay not be present) and severe scleral injection (super red eyes) untreated animals usually become comatose and die within 72 hours after onset of symptoms. Treatment is usually procaine penicillin G in early cases, more advanced cases may require IV penicillin and other life sustaining measures like IV fluids, steroids, plasma, oxygen, anti-inflammatory drugs and dopamine to treat hypotension (low blood pressure) and sepsis/bacteremia (infection that has taken over the blood stream causing widespread issues) the organism multiplies once in the body causing the septicemia and the rate at which is multiplies and the level of immunity determines how and when the clinical symptoms will present. Remember, every pig will not present with the same symptoms. Not every pig will have lesions, some will have lethargy and no appetite, while others may have all the classic signs. The key is early detection and treatment. The symptoms were touched on earlier on, but it's a sudden onset, sometimes death is the only symptom, stiffness in the joints or reluctance to rise indicating a possible joint infection (arthritis) and lumps, the lumps can often be felt or palpated in the early stages before anything can be seen. Restricted blood flow causes the small raised areas referred to as "diamonds", they are clearly defined, become red and finally black due to dead tissue, but no abscesses. Some pigs skin will slough off leaving gaping holes in the skin as well. Most heal within 7-10 days. The diamond shaped lesions (rhomboid skin) aren't always present, but more of an inconsistent feature only with acute cases. If you see these lesions, you know what it most likely is, but again, this illness can be present without the lesions as well. Most will have a fever, usually a high fever (103 and up) There have been pigs that were confirmed to have erysipelas and their lesions didn't look anything like the classic diamond shape. 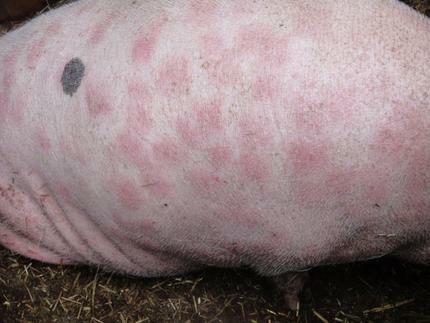 If your pig develops areas of concern that are purple or red and not in a diamond shape, this can still be erysipelas. There are pictures below that are all confirmed to have been erysipelas and not all have "classic" lesions. Not all pigs get lesions either, so you cannot wait if you suspect something is wrong. Waiting can literally cause your pig to die. It doesn't seem to be a seasonal disease, but is it seems to be a greater threat during the warmer months. Presumably, this is because most pigs will begin digging again once the ground thaws and is easier for them to uproot using their snouts. During the warmer months, most pet pigs that are considered "indoor pigs" start spending more time outdoors and when they're outdoors, they are constantly on the hunt for food. The actual organism is a gram + bacillus (if you're a medical nerd like me, you'll appreciate that) and once a pig contracts the virus and it is treated, they are immune to getting that strain again as they will have built up antibodies; although the infrequently seen chronic Erysipelas may be an exception to this general observation. But remember, there are acute and chronic forms of this disease and they present differently and the acute forms usually present with classic symptoms, the chronic form is less detectable and may or may not have the acute symptoms present but cause long term damage like the arthritis and heart valve issues. There have been many pigs that have presented with symptoms like lower grade fevers, unsteady on their feet, suddenly lethargic and usually off their feed and this combination of symptoms has stumped many veterinarians. Some vets will treat with a broad spectrum antibiotic, some will treat the fever, some will simply ask the pig parents to monitor the situation and make them aware of any significant changes in condition. Usually we are notified or asked when the situation becomes more desperate or a post is made that we see. We are not vets, we cannot diagnosis anyones pig over the computer or on the phone...BUT, in most cases, we will suggest injectable Penicillin and most pigs condition improves rather drastically in a couple of days. Sometimes there are lesions present, other times there isn't. There have been times when the lesions showed up after treatment began, nonetheless, the source is likely erysipelas and that's why there was improvement with the treatment of injectable penicillin. This minor phenomenon happens every years around this time when we begin to see our first really hot days of summer. So much so that one of the first questions that should be asked is; "Has the weather in your area suddenly turned unusually hot within the past week?" Erysipelas is a bacteria found in most soils. It is a very hard bacteria, which can survive a wide range of temperatures and conditions. It is often spread by birds and bird droppings. Most pigs who spend any time outdoors grazing, foraging and rooting have probably been exposed to this bacteria. Stress, especially the stress caused to a pig by a sudden spike in temperatures, often seem to "trigger" the Erysipelas and the pig becomes ill over a period of a few days. (So this would fall more into the chronic erysipelas category)Pigs who contract it can present as peracute, acute, subacute or chronic. Peracute pigs often show no signs or symptoms, but may simply be found dead from no apparent cause. Most cases that are heard about are either acute or sub acute. In the acute...the fever is often spiked high (102 and up), the pig often is unable to walk at all and the pig may seize. In the sub acute, the pig's fever may come and go and it may never be dangerously high. The pig may have an unsteady gait or be wobbly on his legs. In both presentations, the pig loses interest in food and becomes lethargic. In about 70% of the cases there will be evidence of round or rhomboid shaped "bumps" that start to form on various parts of the pig's body. 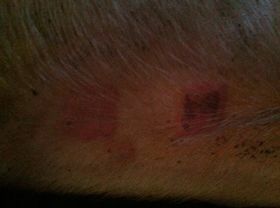 These bumps are a late finding and, if left untreated, may go on to get larger, eventually turn necrotic and large amounts of skin will slough off the pig. Vaccinations are available for erysipelas, but since there are 23 strains, the vaccinations do NOT cover all strains, so vaccinations do not always prevent the disease, but typically lessen the severity/chances of the 3 most common strains. **Just because your pig has been vaccinated doesn't mean your pig can not contract erysipelas!! Do not disregard the symptoms just because your pig was vaccinated. Penicillin G can save a pigs life if given early on. 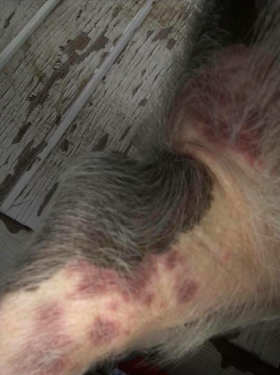 The pictures below are all confirmed cases of erysipelas. If you look closely, you can see not all have the classic lesions, some do not even look square or "diamond" shaped at all. One single erysipelas lesion. This is a confirmed case. Note the "diamond" shape under the skin. 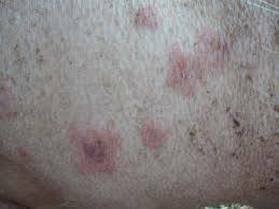 These photo's below are from a black pig with confirmed erysipelas, as you can see, the lesions are extremely difficult to see. What you may see AFTER a pig is treated for erysipelas presenting with the classic "diamond shaped" lesion....The skin had restricted blood flow which is why the lesions surfaced in the first place. That skin will slough off because the surface tissue has become necrotic and will eventually fall off. These areas need to be kept clean because your pig can get a secondary infection from these open areas.